Tim Thomas, Goalie, Boston Bruins – Thomas had an M.V.P. performance in goal for the Bruins during the regular season. His postseason was even better. Thomas gave one of the most brilliant performances for a goalie in postseason history as the Bruins romped to their first Stanley Cup Championship since 1972. He was coming off of an injury riddled 2009-2010 season and young goalie Tuuka Rask had emerged as a goalie with a bright future that year. The roles were reversed in the 2010-2011 season when Rask couldn’t stay on the ice and Thomas was back healthy. He started 57 games in goal for the B’s and had a record of 35-11-9. His 35 wins were one off of his career high of 36 set back in the 2008-2009 season. He had 9 shutouts, which shattered his previous career high of 5. His .938 save percentage was also a career high. In all he saved 1,811 shots on goal. He was the best goalie in the regular season and won the Vezina Trophy for being the most outstanding goalie in the regular season. When the postseason rolled around Thomas took his game to a whole nother level. He started all 25 games that the Bruins played on their way to the cup posting a 16-9 record. Thomas had 4 shutouts during the Stanley Cup finals including two in Game 7s. He broke the record for most saves in a postseason (798) as well as most saves in the Stanley Cup finals (238). After shutting out the Tampa Bay Lightning in an exciting 1-0 win in Game 7 of the Eastern Conference Finals he brought out his best for the Stanley Cup finals. Thomas only let in 8 shots compared to the 238 that he turned back against Vancouver. His .967 save percentage in the finals broke a 66-year old record. After he shut out the Vancouver Canucks 4-0 in Game 7 in Vancouver Thomas was named the Conn Smythe trophy winner for being the M.V.P. of the Stanley Cup playoffs. At 37 years old he became the oldest player to ever win the Conn Smythe trophy. If you could believe it, Thomas’ numbers at the beginning of the 2010-2011 season are even better. He is 16-5-2 through 23 games with 4 shutouts. His .940 save percentage thus far this season is even better than last year. It’s a long road to a Stanley Cup repeat and it’s a tall order to repeat the historic performance of last year’s Stanley Cup finals. If the beginning part of this year is any indication however it looks like Thomas may be up for the challenge. Kevin Durant, Forward, Oklahoma City Thunder – Durant had high hopes coming into the league after a year at the University of Texas. 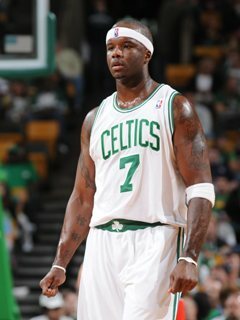 He was drafted 2nd overall by the Seattle Supersonics in the 2007 NBA draft. After a season in Seattle the Supersonics were sold and moved to Oklahoma City where they become the Thunder. Durant was to be the centerpiece of the relocated franchise. Durant was the rookie of the year for the 2007-2008 season and finished second behind Lebron James in the M.V.P. voting after the 2009-2010 season. 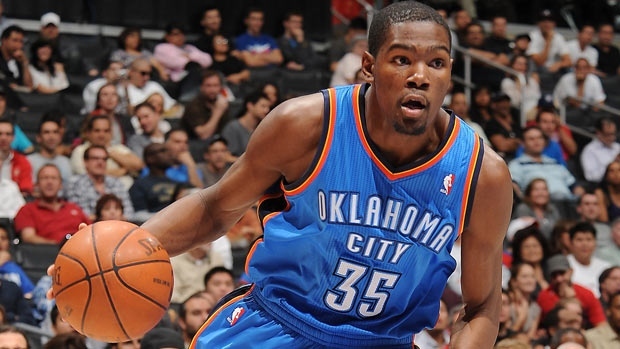 It was the 2010-2011 season, however, that Durant brought the Oklahoma City Thunder to new heights. The Thunder won 50 games and earned the #8 seed in the playoffs a year prior. In ’10-’11 the Thunder won 55 games and earned the #4 seed in the playoffs. Durant was the centerpiece, as he was expected to be when they drafted him. He lead the NBA in scoring for a second year in a row with a 27.7 points per game average. He also had 6.3 rebounds and 2.7 assists in the 78 games that he played for the Thunder. He saved his best work for the playoffs. After sneaking into the playoffs and losing in the first round to the Lakers in 6 games the season prior, Durant and the Thunder were primed for a deeper playoff run. The Thunder beat the Denver Nuggets in 5 games in the first round of the playoffs. The upstart #8 seed, the Memphis Grizzlies, took the Thunder to 7 games in the second round, including a triple overtime Thunder win in which Durant had 35 points and 13 rebounds. The Thunder won that series but lost to the Dallas Mavericks in the Western Conference finals in 5 games. Durant bettered his numbers from the regular season during the playoffs, scoring 28.6 points per game with 8.2 rebounds and 2.8 assists per game. Despite falling three wins short of the NBA finals Durant had established himself as not only a regular season star but a postseason one as well. He looks to have grown into the role of franchise player for a young team that looks to be on top of the Western Conference this year as well as years to come with a roster that features young players such as Russell Westbrook, James Harden, and Kendrick Perkins. The Thunder are off to a quick start in 2011-2012 with a 4-0 record. Durant has averaged 31.3 points in 7.3 rebounds in 4 games. Kevin Durant is positioned as one of the few players ready to take the title of best player in the NBA from the aging Kobe Bryant. A title in 2012 would go a long way in preserving that role. 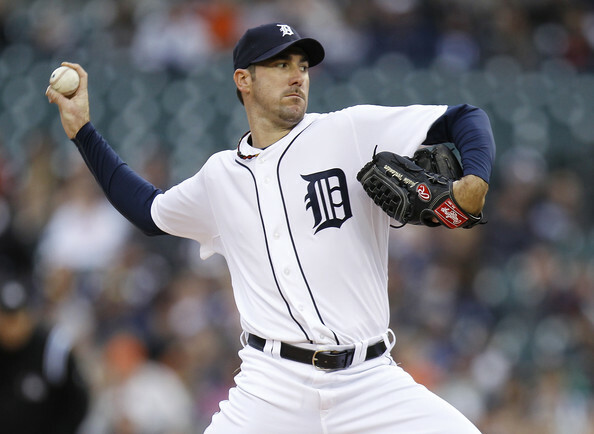 Justin Verlander, Pitcher, Detroit Tigers – At just 28 years old Justin Verlander has become the most dominant pitcher in Major League Baseball. Verlander threw his first career no-hitter when he was 25 years old back in 2007. He was coming off of seasons in which he posted records of 19-9 and 18-9. The Tigers ace saved his best performance for the 2011 season. The numbers weer astounding. He posted a 24-5 record in 34 games started. He had a 2.40 career ERA, almost a full run less than his previous career low of 3.37 in 2010. His 250 strikeouts led the American League and was better than all but his 269 strikeouts in the 2009 season. He threw the 2nd no-hitter of his career on May 7 against the Toronto Blue Jays. At 28 he became only the 13th pitcher in major league history to throw multiple no-hitters. Verlander led the American League in wins, strikeouts, and ERA, earning him the pitcher’s triple crown. Verlander was the unanimous winner of the American League Cy Young award after the season. He was also voted as the American League M.V.P., the first pitcher to win it since Dennis Eckersley in 1992 and the first starting pitcher to win it since Roger Clemens in 1986. The M.V.P. award was well deserved, as the Tigers were only 70-58 in games that Verlander didn’t start. The 25 wins in his starts brought the Tigers win total to 95. He was by far the most important player on the Detroit Tigers AL Central winning team. Verlander was not able to show his dominance in Game 1 of the ALDS against the Yankees as he only pitched one inning before the game was suspended due to rain. He came back and won Game 3 of the Series, going 8 innings and giving up 4 runs in a 5-4 Tigers victory. The Tigers won the series in 5 and Verlander was to start Game 1 of the ALCS. He only lasted 4 innings in the start, giving up three runs in the 3-2 Game 1 loss. Verlander bounced back in a must-win Game 5 of the ALCS with a win over the Rangers. He went 7 1/3 innings, giving up 4 runs on 8 hits in a 7-5 victory. It was all for naught however as the Rangers won Game 6 and eliminated the Tigers. Verlander’s dream season came up short but at 28 the tall right-hander looks to have many more opportunities at the World Series. Lost in the saga of beer and chicken, pain pills and September collapses was the fact that the Boston Red Sox made perhaps there best acquisition since David Ortiz, or at least Josh Beckett, last December when they acquired first baseman Adrian Gonzalez from the San Diego Padres. 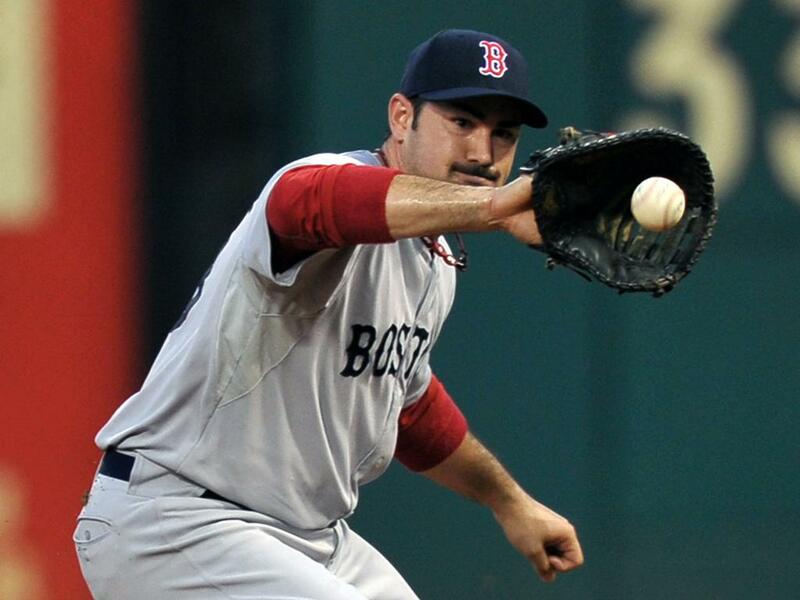 Gonzalez was long coveted by former Red Sox general manager Theo Epstein and his baseball staff. When the Red Sox lost out on Mark Teixeira before the 2009 season they made acquiring Gonzalez one of their top priorities. They finally got their man on December 6, 2010 when they sent prospects Anthony Rizzo, Casey Kelly, Eric Patterson, and Reymond Fuentes to the Padres for Gonzalez. Gonzalez was a duel threat, one of the best hitters in the game as well as one of the best defensive first basemen. Gonzalez did not (personally) disappoint in his first season with the Red Sox. He had a line of .338/.410/.957 with 27 home runs and 117 RBI. He was a 1st time American League All-Star and won a Silver Slugger for being the best offensive first baseman in the American League. He also won a Gold Glove for his prowess in the field, finishing with a .997 fielding percentage. 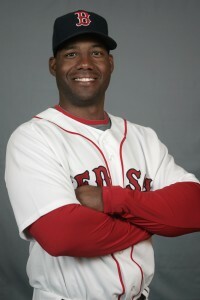 His .338 batting average was highest for a Red Sox hitter since Manny Ramirez hit .349 in 2002. Although the season didn’t end with a playoff berth it is hard to argue that Gonzalez didn’t do his part in trying to get the Sox to October. The scary part, for opposing pitchers at least, is that he did all that at less than 100% health. Gonzalez had surgery on his shoulder early in the off season, a few weeks before he was traded to the Red Sox. The surgery for Gonzalez sapped much of his power. He would go a few weeks where he would use his opposite field power to wear out the Green Monster in left field but then his shoulder would get too sore and he would go back to pulling the ball for a stretch. With his shoulder back to 100% for 2012 you should see more consistent power to the opposite field, and more consistent power in general. Gonzalez really has the potential to be a 40 home run guy every year, and think about it – he had 117 RBI on only 27 home runs last season. With Ellsbury, Pedroia, and maybe a better Carl Crawford hitting in front of him, how many RBI will he post if he hits at or near 40 home runs? Gonzalez’s swing was made for Fenway Park but his shoulder didn’t let him show it in 2011. Expect to see more of the Fred Lynn/Mo Vaughn/Yaz opposite field power that makes left handed hitters who call Fenway Park home great. Gonzalez will only celebrate his 30th birthday this coming May. Historically major league players enjoy their best success between the ages of 29 and 31. Power hitting first basemen such as Gonzalez usually get a grace period to about 33 or 34 at optimal power and hitting before they suffer a regression. That means we have a solid 4-5 years left of one of the best pure left handed hitters in baseball. Conversely the multiple time Gold Glove winner should not see much of a regression on the field anytime soon either. 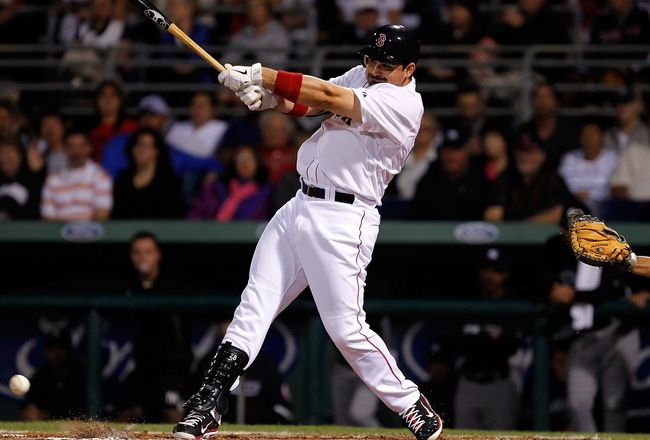 With the possible exception of Ellsbury, Gonzalez will prove to be the most important piece of the lineup for the 2012 season. Like last year, you can expect Gonzalez to anchor a lineup that will hold up it’s end of the bargain. Here’s to hoping that the rest of the team can do the same. Last year ended with a whimper and people remember Gonzalez for complaining about the schedule and other things after the last game. Don’t let that make you forget the outstanding season he had last season and the outstanding seasons he will have in the future. If the Sox turn it around and get back to the postseason in 2012 I would expect that the only thing people will remember about Gonzalez in 2011 is the great year that started his career with the Red Sox. Imagine if your franchise had been in existence for 50 years and they’ve yet to win a championship. Now you were one strike away from your team’s first championship ever. Twice. And you didn’t win. That’s how the Texas Rangers felt after Game 6 of the World Series. The Rangers were leading the World Series 3-2 and needed to take one of the final two games back in St. Louis to clinch their first World Series title ever. It was a cool October night and St. Louis was trying to stave off elimination while the Rangers were trying to get to the promised land for the first time ever. 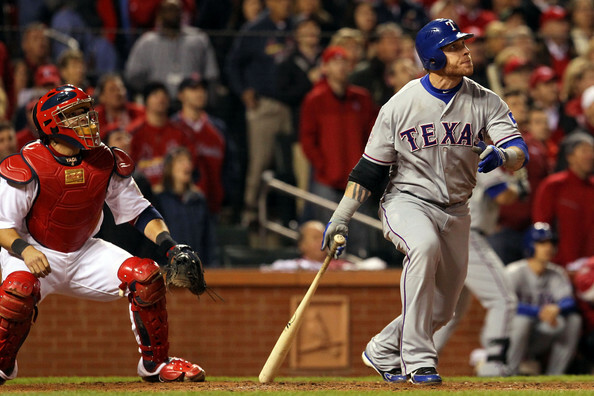 The Rangers jumped out to an early lead when Josh Hamilton singled home Ian Kinsler in the 1st. It might have been the time when you started to count the outs but they only got to 25 outs away before they relinquished the lead when Lance Berkman hit a two-run home run with two outs in the bottom of the 1st. The Rangers tied the game at 2 in the bottom of the 2nd when Ian Kinsler doubled home Craig Gentry. Cardinals starting pitcher Jaime Garcia labored through the first three innings, giving up 5 hits and walking two. On their other side Colby Lewis settled down after he gave up the home run to Berkman and then walked Matt Holliday by setting down the next 7 hitters. It was 2-2 after three innings. Garcia’s night was done after three innings and replaced by Fernando Salas. The 4th started off with an error out in left field by Holliday that put Nelson Cruz on 2nd. Mike Napoli, one of the stars of the Rangers playoff run, followed up with an RBI single to give the Rangers a 3-2 lead. 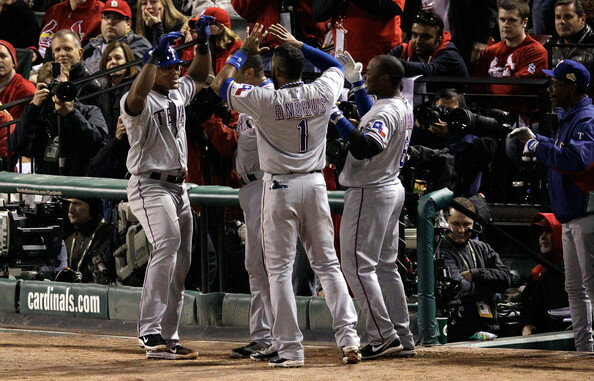 The countdown was on again, this time the Rangers only needed 18 more outs to be champions. Once again the countdown ended quickly when Lance Berkman, who led off the inning by reaching on an error by first baseman Michael Young, came across the plate on a ground ball by Yadier Molina to tie the game at 3-3. Cardinals third baseman David Freese was the latest victim of the error bug as his 5th inning error allowed Josh Hamilton to reach and score when Michael Young redeemed himself with an RBI double. It was 4-3 Texas and the countdown was down to 15. The Cardinals went down in order in the bottom of the 5th, putting the countdown at 12. The third Cardinals pitcher of the night, Lance Lynn, worked around a Josh Hamilton hit to retire the Rangers in the 6th. Albert Pujols led off the bottom of the 6th with a strike out and the Rangers needed 11 more outs. The pesky Berkman got himself another hit and Michael Young once again committed an error on Matt Holliday’s grounder and the Cards had 1st and 2nd with one out. David Freese walked to load the bases and Rangers’ manager Ron Washington made his first pitching change of the night, bringing in Alexei Ogando to replace the starter Lewis. Ogando walked Molina and the game was tied again. With Nick Punto batting with the bases loaded Mike Napoli gunned down Holliday at 3rd base. Then Ogando unloaded a wild pitch that put the remaining runners on 2nd and 3rd. Punto walked but pitcher Derek Holland came in to get Jon Jay to ground out, leaving the bases loaded and the game tied at 4-4 after 6 innings. As quickly as the Cardinals tied the game in the 6th they let it slip even quicker in the top of the 7th. Adrian Beltre smashed a home run to lead off the inning and Nelson Cruz followed up with one of his own to give the Rangers a 6-4 lead in the 7th. The Rangers tacked on one more run in the 7th and had a 7-4 lead with 9 outs to go for a championship. Derek Holland, who had just started two games prior for the Rangers, put down the Cardinals 1-2-3 in the 7th, leaving the Rangers 6 outs away. The Rangers went 1-2-3 in the 8th and Holland was back out for the bottom of the 8th. He got Berkman on a fly out to put the Rangers 5 outs away. Allen Craig, who had come in for an injured Matt Holliday, hit a solo shot off of Holland to cut the lead to 7-5. After a Freese ground out Yadier Molina singled to right to end Holland’s night. Mid-season trade acquisition Mike Adams came on with two outs and a man on 1st. Pinch hitter David Descalso reached on a weak ground ball to short and Jon Jay hit a hard single into right, loading the bases. Adams got shortstop Rafael Furcal to ground the ball back up to him and the Cardinals left the bases loaded in the 8th, down two runs. Cardinals closer Jason Motte came in for the top of the 9th and worked around a Napoli walk to retire the side. In came Neftali Feliz for the Rangers, who had 32 saves during the regular season, to get the last three outs in the 9th and give the Rangers their first World Championship. Feliz got Theriot to strike out swinging to put the Rangers two outs away from glory. The Cardinals (former) hero Albert Pujols was up next and he came through for his old team with a one out double. Berkman walked to make it 1st and 2nd with 1 out. Allen Craig was the next batter. Feliz struck him out too. The Rangers were now 1 out away. Feliz jumped ahead of David Freese 1-2. The Rangers were one out away. The FOX cameras panned to a close-up of the faces of each of the Rangers stars as they anticipated the celebration. Feliz rocked back and hurled in his 1-2 pitch. Freese connected. It was a line drive but not that hard hit, it was heading for right field. Nelson Cruz was heading back and the ball kept sailing and sailing until it hit the wall, just out of the reach of Cruz’s glove. Pujols and Berkman scored and Freese was standing on third with a game tying triple. The Rangers were close but they couldn’t get it done. Feliz had given it up and after Molina lined out to right, they would have to play extra innings. The Rangers were not demoralized however and Elvis Andrus hit a one out single up the middle off of Motte. The next hitter was Josh Hamilton, who could have amassed a Hall of Fame career if the early part wasn’t derailed by drug abuse. He was given a second chance in baseball and now he was ready to take advantage of the Rangers’ second chance in this game. He came through, blasting a home run well over the wall in right field to give the Rangers a 9-7 lead. They headed into the bottom of the 10th, once again 3 outs away. Darren Oliver was the new Rangers pitcher and he gave up hits to the first two Cardinals hitters, David Descalso and Jon Jay. Cardinals pitcher Kyle Lohse pinch hit for Motte in the pitcher’s spot and hit a sacrifice bunt to put the runners on 2nd and 3rd. The tying run was in scoring position but the Rangers only needed two more outs. Scott Feldman came into the game for the Rangers. Ryan Theriot hit a ground ball to third base and Descalso scored. Jay remaind at second and Theriot was out at first. The Rangers needed one more out. With Pujols coming to the plate there was no doubt that he would be walked but one the the Cardinals heroes of the night, Lance Berkman, was up next. He worked it to a 2-2 count. The Rangers were once again 1 strike away. Berkman laced the 2-2 pitch into right-center field for a single that scored Jay and once again tied the game at 9-9. The Rangers weren’t up for more late inning heroics and new Cardinals pitcher Jake Westbrook worked around a Napoli hit to retire the Rangers in the top of the 11th. Mark Lowe came into the game for the Rangers to pitch the bottom of the 11th. Cards’ third baseman David Freese was up next. Freese hit the game tying triple in the 9th but he had a much bigger story than that. He grew up in Wildwood, Missouri as a St. Louis Cardinals fan. He went to the University of Missouri, where he did not play baseball. When he realized that he wanted to play baseball he quit Missouri to go to St. Louis Community College so he could play ball. He eventually transferred to South Alabama to finish his college baseball career. Freese was drafted by the San Diego Padres and was traded to his former boyhood team, the Cardinals, for Jim Edmonds, who was one of the more popular members of the Cardinals during his time there. In December of 2009 he was arrested for driving under the influence and almost lost his career because of it (it was his third arrest since 2002). Freese got himself together and became the starting third baseman for the Cardinals in 2011. All of that led him here, to Game 6 of the World Series where he had already become the hero. He wasn’t done yet. He hit a Mark Lowe pitch far and deep into straight away center field that landed in the grass a few feet past the center field wall. The Cardinals had come back from dead twice in the game. Then Freese walked it off in the 11th. 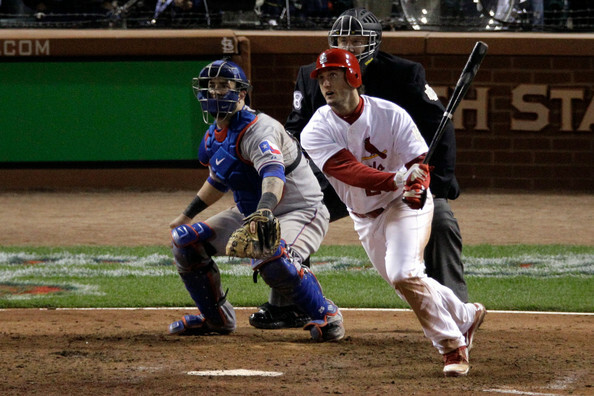 The Cardinals went on to win Game 7 6-2 and David Freese was named the World Series M.V.P. But this is the game that everyone will remember. Just like in 1975 and 1986 the 6th game will always trump the 2nd. Not many people knew David Freese’s name before the World Series but now his name lives on with other Game 6 legends – Carlton Fisk, Bill Buckner, Kirby Puckett, David Freese. 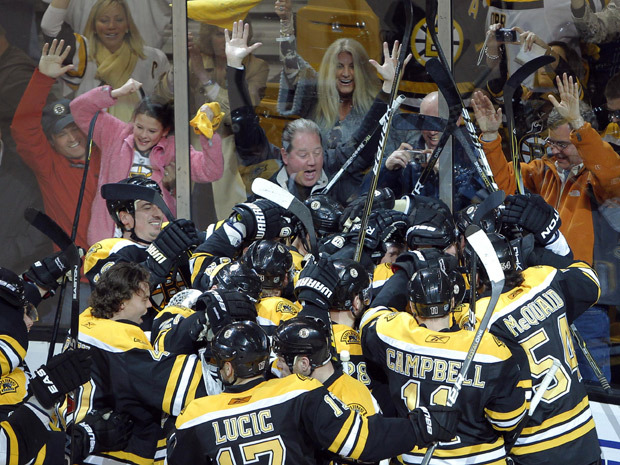 The Bruins were one win away from making the Stanley Cup finals for the first time since 1990. All they had to do was beat the Tampa Bay Lightning in Boston in Game 7 of the Eastern Conference Finals. Dwayne Roloson, the Lightning goalie, was not going to give in so easily but luckily for the B’s they had Tim Thomas on the other side. Thomas may not even been as good as Roloson in Game 7 but he was just good enough to send the B’s to their first Stanley Cup finals in 21 years in a grueling game 7 to decide the Eastern Conference champion. The 1st period was played flawlessly by both teams defensively. The Lightning only got 8 shots on goal, all saved by Thomas. The Bruins were the aggressors in the 1st period, taking 14 shots at Roloson. He turned them all back. The Bruins continued the onslaught in the 2nd period and again Roloson took everything that they spit at him and turned it away. 14 more shots by the Bruins and 14 more saves by Roloson. Thomas stood his own ground, turning back all 9 shots that he had seen in the period. It was 0-0 after two periods. Both teams had killed power plays, thwarted break-aways and banged each other into the boards and there was only 20 minutes left in the hockey game. Neither team had put the puck in the net. It seemed that whoever could do so first may be the one to raise the Eastern Conference Championship Trophy. It wouldn’t be easy. Dwayne Roloson had already stopped all 28 shots that he had faced and Thomas had turned back all 17 that he had. 10 minutes quickly went by in the 3rd period. Tim Thomas stopped 4 shots from the Lightning while Roloson was still flawless, stopping stopping 5 of his own. There was only 10 minutes left and it didn’t seem like this stalemate was going to end anytime soon. Roloson stopped another shot off of the stick of David Krejci just over the 10:00 mark, giving him 34 saves for the night. Thomas turned back a Vincent Lecavalier shot about 11 minutes in, giving him 22 saves of his own. With only 7 1/2 minutes to go a David Krejci pass was deflected right into the stick of Nathan Horton who had only Roloson between him and the net. He stuck his shot past Roloson and into the back of the net for the first goal of the night. Roloson’s perfect night was ruined after he turned back the first 34 shots that he had faced. #35 was the lucky one for Horton, who already had a series winning shot against the Canadiens. The Lightning couldn’t muster up any offense in the last 7 minutes as the Bruins defense smothered them. They only managed two more shots on goal, both saved by Thomas. Thomas stopped all 24 shots that he faced on the night. Roloson finished with 37 saves overall but it was the 38th that would send him home for the summer. The Tampa Bay Lightning lost the perfect hockey game. Someone had to lose. The Bruins won and continued on their storybook ride to the Cup, which culminated a few weeks later when they defeated the Vancouver Canucks in 7 games to win the Stanley Cup. This was one of those perfect games where fans of both teams were on the edge of their seats throughout and even those who weren’t fans couldn’t help but be intrigued to the end. Players earn chapionships and the Bruins more than earned their championship with their effort this night against the Lightning. This might be a bitter pill to swallow for members of Red Sox Nation but the last day of the major league season was about as good as the MLB could hope for. Both wild card spots were up for grabs between 4 teams (Red Sox, Rays, Braves, Cardinals), two who have given up large leads in the month of September. As a matter of fact only one playoff series had been set at that point, the Diamondbacks vrs. the Brewers. The Tigers and Rangers were still battling for the #1 seed. The four games that would determine the last two wild card spots were all inter-divisional games. The Red Sox played the Orioles, the Rays played the Yankees, the Braves played the Phillies, and the Cardinals played the Astros. St. Louis was not waiting around as they jumped over the last place Astros with 5 runs in the top of the 1st. In Atlanta the Phillies scored in the top of the 1st putting the pressure on the Braves but they responded by tying the game in the bottom of the 1st. Down in Tampa the Yankees manufactured a run and got out to a 1-0 lead. The Sox and Orioles went scoreless in the 1st. The only scoring in the 2nd inning came down in Tampa when the Yankees got 4 runs on a Mark Teixeira grand slam to give the Yankees a 5-0 lead. The Sox and Orioles got it going in the 3rd inning when Dustin Pedroia singled in a run in the top of the 3rd. J.J. Hardy erased the lead in the bottom of the 3rd with a 2-run home run off of Jon Lester to give the O’s a 2-1 lead. Down in Houston Chris Carpenter helped his own cause in the top of the 3rd with an RBI single to give the Cards a 6-0 lead. 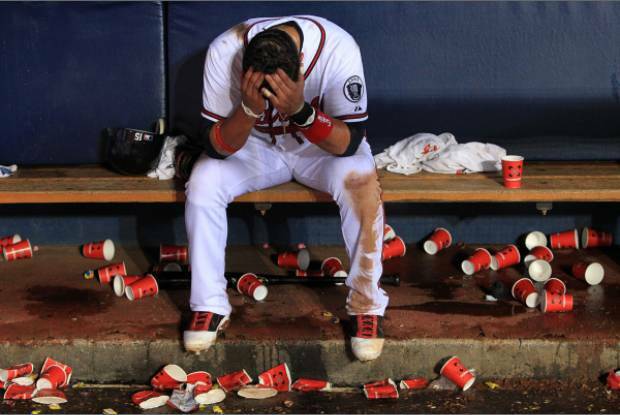 Down in Atlanta Dan Uggla put the Braves on top 3-1 with a homer in the bottom of the 3rd. The night was just getting started. The Sox tied the game up at 2-2 in the 4th inning when Marco Scutaro scored on a balk. Down in Tampa Mark Teixeira once again helped out the team he snubbed by hitting a solo shot and making the score 6-0 Yankees in the 4th. 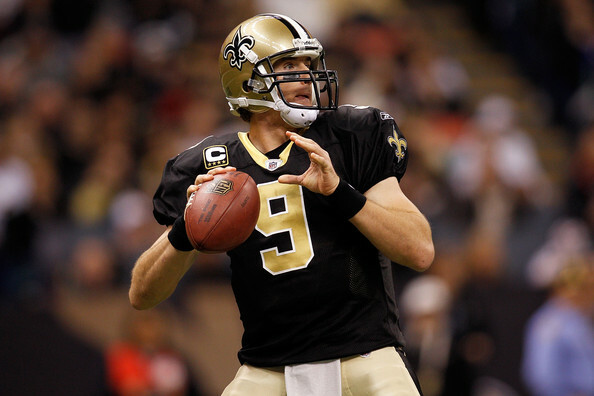 St. Louis added another run in the 5th giving them a commanding 7-0 lead over Houston. In Tampa Andruw Junes added a home run for the Yankees putting the Rays in a 7-0 hole. Dustin Pedroia’s solo shot in the top of the 5th gave the Red Sox a 3-2 lead after 5. Halfway through the games the Red Sox were in good shape to take the wild card spot with a lead against Baltimore and a big hole for the Rays down in Tampa. Over in the National League the Cardinals were cruising and the Braves were locked in a battle with the Phillies. The next scoring in any of the four games game in the top of the 7th in Atlanta when the Phillies pushed across a run to cut the Braves’ lead to 3-2. The Red Sox and O’s were battling rain in Baltimore and the AL wild card race was about to take a turn. Down in Tampa the Yankees led 7-0 going into the bottom of the 8th. After Boone Logan let the first three guys on the Yankees brought in Luis Ayala, who promptly walked and hit the first two guys he faced to cut the lead to 7-2 with the bases still loaded with no outs. Desmond Jennings struck out and B.J. Upton hit a sac fly to score a run and make it a 7-3 game but the Yankees were one out away from getting out of the inning. 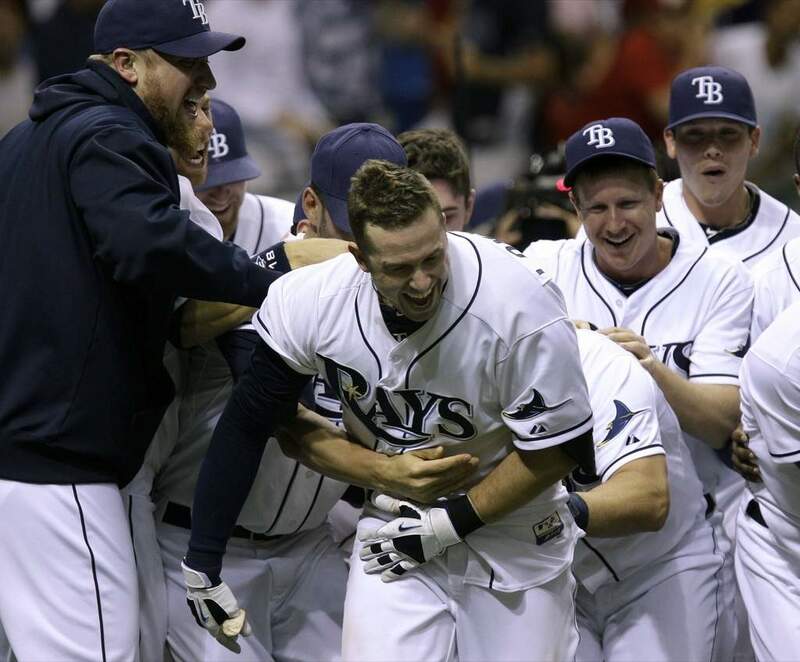 Evan Longoria had different plans however as he laced a three run home run off of Ayala to suddenly make it a 1 run game at 7-6. The 9th inning was about to make things interesting. The Cardinals added an insurance run in the top of the 9th and finished the game and clinched at least a spot in a one game playoff against the Braves. Over in Atlanta they were three outs away from earning a spot in that game themselves. Craig Kimbrel loaded the bases with one out and Chase Utley coming up. Utley hit a sacrifice fly to tie the game at 3-3. The Sox and O’s were in a rain delay while the Yankees were 3 outs away from possibly eliminating the Rays. With 2 outs and 2 strikes utility man Dan Johnson hit a game tying home run to send the game to extra innings. The Red Sox and Orioles went into the 9th inning around the same time that the Yankees and Rays were entering the 12th. Jonathan Papelbon came in and struck out the first two guys that he faced, putting the Sox one out away from a berth in a one-game playoff if the Rays won in extra innings. Chris Davis hit a double. Nolan Reimold came up and hit a ground rule double of his own, tying the score at 3-3. Robert Andino was the next hitter. He hit a line drive towards Carl Crawford and Crawford slide but could not make the catch and Reimold scored from 2nd and won the game 4-3. Mere minutes later in Tampa Evan Longoria came up again. This time he hit a game winning home run to knock the Red Sox out of the playoffs and put them back in. Moments later down in Atlanta the Phillies put together a run in the top of the 13th. The Phils ended the night’s drama by shutting the door on the Braves and their playoff hopes, making the Cardinals and Rays, both 10 games out at the end of August, into the playoffs. Many people jumped on the Rays bandwagon at that point. They could only manage an opening series win against the Rangers before dropping 3 straight and were eliminated. The Cardinals were another story. After the Phillies helped them get into the playoffs by beating the Braves on the last day of the season, they returned the favor by beating them in 5 games in the National League Divisional Series. No matter who you are a fan of you can’t deny the excitement on the last day of the season. If the MLB could repeat this every year they would. Too bad they can’t write the scripts themselves. The Red Sox have gotten their closer to replace Jonathan Papelbon, acquiring Andrew Bailey from the A’s in a five player deal on Wednesday. The Red Sox will be sending Josh Reddick and prospects Miles Head and Raul Alcantara to the Athletics. They will receive Andrew Bailey and outfielder Ryan Sweeney in return. 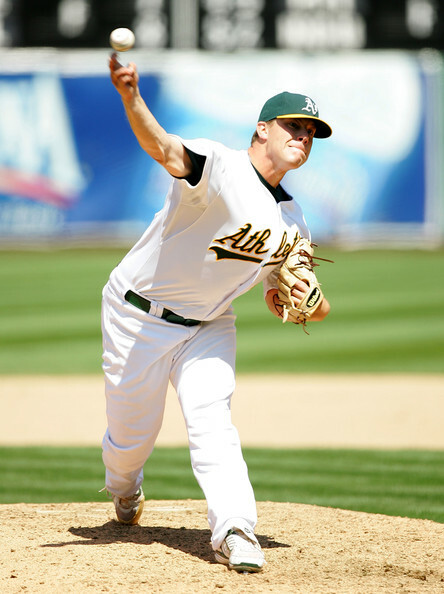 Bailey, 27, has been the Athletics closer for the past three years since his debut in 2009. He won the American League Rookie of the Year in ’09and was named to the American League All-Star Team when he posted 26 saves with a 1.84 ERA and a .876 WHIP in 83.1 innings. He also had a 6-3 record. In 2010 he was once again named an AL All-Star and finished the season with 25 saves and a 1.47 ERA and .959 WHIP in 49 innings but lost a month to an elbow injury. Last year he posted 24 saves and a 3.24 ERA and 1.104 WHIP in 41.2 innings after missing the first two months of the season due to a forearm strain. Bailey was healthy for the rest of the season and the Sox hope that his injury worries are behind him. Ryan Sweeney is a decent outfielder, not a full-time player, but he’s the prototype hitter for the Sox lineup, which is not surprising because he was the prototypical hitter for the A’s lineup as well. He has a career .283/.342/.720 line in 6 seasons. He is not a power threat, he only had 14 career home runs, but that can change once he is out of Oakland. He’s a decent defensive outfielder but that makes him a lot better than Reddick. I seem him as a platoon right fielder, much the same way I saw Reddick, with another right handed hitter added to the mix. Once again the Sox move a minus defensive player (Reddick, like Lowrie) and replace him with someone of similar offensive production but superior defensive ability (Sweeney, like Punto). All in all I love what Ben Cherington has done with the bullpen this off-season. Bailey and Mark Melancon are both young and cost-controlled and figure to be a great 1-2 for the next few years and maybe beyond if they can sort out extensions. They could still use another right-handed arm but with Albers, Morales, and Aceves and the everyman, it is shaping up to be a good bullpen. What I like: Rajon Rondo is playing with a chip on his shoulder after the trade rumors involving him and Chris Paul. He’s responded with a 31 point, 13 assist, 5 rebound opening game against the Knicks followed by a 22 point, 12 assist, 8 rebound game against the Heat. He looks like one of the premiere point guards in the league and the bitter taste of the trade rumors aren’t going away anytime soon, so expect him to stay motivated. 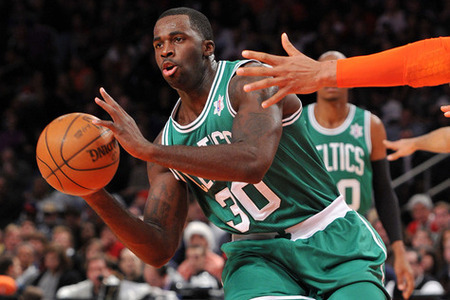 Brandon Bass and Keyon Dooling have been great additions to the Celtics bench. Bass had 20 points and 11 rebounds off the bench on Christmas day against the Knicks and followed up with a 13 point, 5 rebound performance last night against the Heat. Dooling was quiet on opening day with 4 points and 3 assists but made up for it last night with 18 points against the Heat, many of which were in the 4th quarter to fuel the Celtics’ comeback attempt. When Paul Pierce and Mickael Pietrus are back in the lineup the C’s team suddenly looks a whole lot deeper with Pietrus, Bass, Dooling, Marquise Daniels and Chris Wilcox coming off the bench. What I don’t like: Kevin Garnett needs to get more involved. He had 15 points and 8 rebounds on opening day and followed up with a 12 point, 5 rebound performance against the Heat. That’s not going to cut it. He may be the one most affected by Pierce’s absence on the offensive side but his rebounding needs to be better for this team to succeed. Sasha Pavlovic is not good. He has more fouls (8) than points (5) in the first two games. He also turned the ball over 4 times last night. Pierce’s return can’t come soon enough so Pavlovic can go to the bench behind Marquise Daniels who should remain as the primary swing man on the bench. And also Jermaine O’Neal, what is it exactly that you do out there? The Celtics look to get their first win of the season tonight in New Orleans and then come home for opening night this Friday against the Pistons. Hopefully Pierce is back healthy soon and the Celtics can rebound from the 0-2 start and begin their quest for their 18th NBA title. 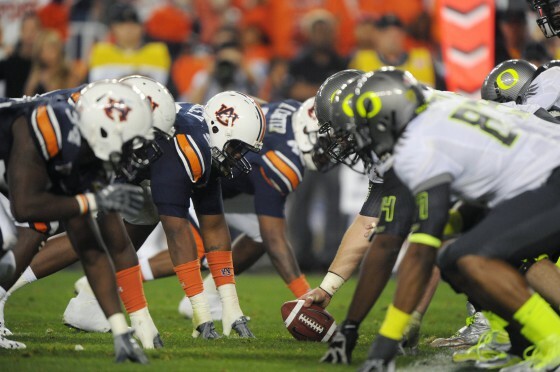 We have to go way back on our calendar for my #4 sports game of the year for 2011, the Tostitos BCS National Championship Game between the Oregon Ducks and the Auburn Tigers. If it seems like it was a long time ago, it’s because it was. Auburn’s starting quarterback that night, Cam Newton, has already broken the NFL single season rookie passing record held by Peyton Manning and the Tigers and Ducks have already played their full 2011 seasons since then. A lot has happened in the sports world since this game was played on January 10 of this year but an exciting game with an ending that featured a brilliant play by a freshman running back puts this one at #4 on my list. After defeating rivals Alabama on November 26th, 2010 by one point Auburn went on to romp South Carolina in the S.E.C. Championship and complete an undefeated regular season with a 13-0 record and earn a spot in the BCS title game. On the other side the Ducks also had to go through their bitter in-state rivals, Oregon State, to secure a spot in the BCS Championship. 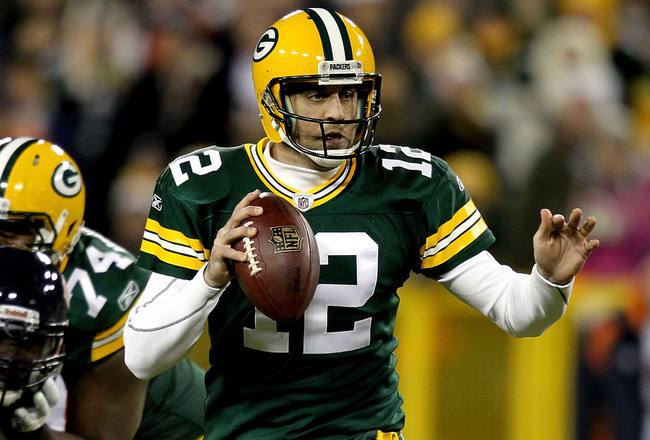 They defeated them handily by a score of 37-20 to complete their own perfect regular season at 12-0. 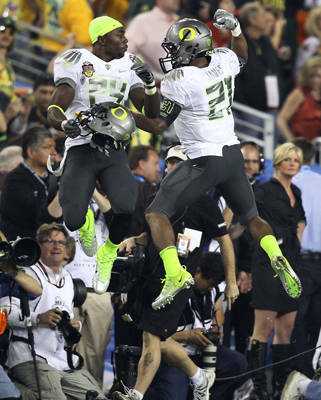 Oregon was a young team that featured sophomore stars LaMichael James and Darron Thomas. Auburn was led by sensation Cam Newton and a stout defense led by interior defensive lineman Nick Fairley. The game started off with the two teams exchanging punts, managing only 1 first down between the two of them. On the Ducks 2nd possession QB Darron Thomas was intercepted on the 5th play of the drive to give Auburn the ball at the Oregon 47. They didn’t hold the ball for that long as Cam Newton was intercepted two plays later by cornerback Cliff Harris at the Oregon 25. Harris returned the ball back 22 yards to their own 47. Thomas took over looking to redeem himself for the earlier pick. He took the team down the field in 7 plays all the way to the Auburn 20 yard line, mostly on rushes by LaMichael James and Kenjon Barner. With 1st and 10 from the 20 the Ducks were primed to get on the board first but Thomas was again picked off by the Auburn defense at the Auburn 14. Auburn dodged a bullet but Newton could not make the Ducks pay as he and the Auburn offense could only manage 5 plays before punting the ball back to Oregon with a little over two minutes remaining in the 1st quarter. Oregon finally got the ball rolling on offense as the opening quarter was coming to a close. They ran 8 offensive plays to close out the quarter and had the ball with a 3rd and 2 at the Auburn 3 as the 1st quarter came to a close. The third down play broke down and Thomas ran backwards for a loss of 6 yards and Oregon settled for a chip shot field goal to give them a 3-0 lead. Newton came out prepared to shake off his disappointing start. With Stanford sophomore Andrew Luck declaring that he would not enter the NFL draft before the game it gave Newton the opportunity to become the #1 pick if he could prove to scouts both here and at the NFL Scouting Combine that he was worth that top pick. He started on the Tigers’ 1st drive of the 2nd quarter. He took Auburn down the field on 8 plays and capped off the drive with a 35 yard touchdown strike to running back Kodi Burns for the first touchdown of the game and a 7-3 lead. That got the ball rolling. The first play of Oregon’s next drive was an 81 yard pass from Thomas to receiver Jeff Maehl to set the Ducks up at the Auburn 12. Three plays later Thomas hit James for a touchdown. The Ducks faked the extra point and kicker Rob Beard ran the ball in for a surprise 2-point conversion to give the Ducks an 11-7 lead. Newton and the Tigers got the ball back determined to slow down the pace and went on a 16 play drive that ended at the Oregon 1 yard line after an incomplete pass by Newton on 4th and goal from the 1. Auburn’s defense picked up Newton and the offense by not allowing James to get out of the end zone on 1st down when they tackled him for a safety to make the score 11-9. Newton took advantage of the free kick in 6 plays, hitting receiver Emory Blake with a 30 yard touchdown pass to give Auburn a 16-11 lead. Oregon and Auburn exchanged punts to close out the first half with a score of Auburn 16, Oregon 11. Newton and the Auburn offense opened the second half with the ball and went 8 plays down to the Oregon 11 until they were stopped on 3rd down, leading to a 28 yard Wes Bynum field goal to give them a 19-11 lead. Oregon’s next drive stalled at the Auburn 40 and they were forced to punt the ball back. Auburn couldn’t manage anything on the next drive, going 3-and-out. Oregon took over at their own 27 and Thomas engineered his own 10 play drive deep into Auburn territory. 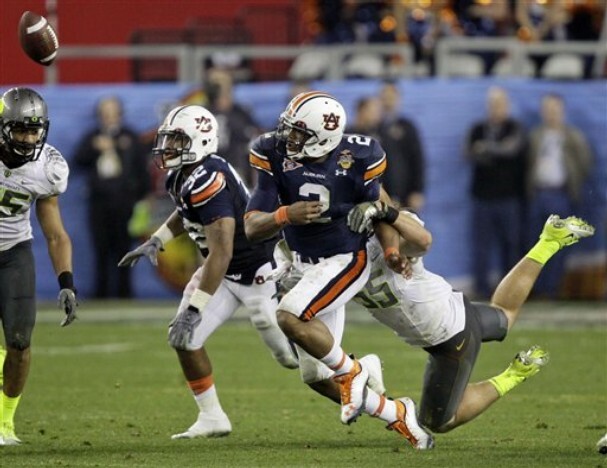 Like Auburn earlier in the game Oregon was 4th and goal from the Auburn 1 yard line, trailing by 8 points. Chip Kelly decided to go for it, like Gene Chizik did earlier. 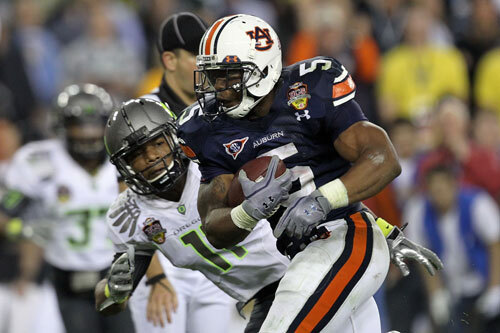 Oregon called a run and Kenjon Barner was stuffed at the 1 yard line, turning the ball over to Auburn on downs. Auburn took over at the 1 but Newton called his own number and ran for three yards to give the Tigers breathing room. Auburn started to move the ball up field and had settled at their own 24 yard line with a 2nd and 9 as the third quarter came to a close. They were one quarter away from winning a National Championship. Newton and company moved the ball out to their own 47 yard line before the drive stalled but they had taken up valuable time and turned the field position over. Oregon got the ball back at their own 16. Thomas and company moved the ball down field but their drive stalled at the Auburn 46 and it was their turn to punt. Punter Jackson Rice could only manage to pin Auburn back to their own 21 yard line. Oregon had squandered an opportunity to pin Auburn back and it was up to the Tigers to take advantage. They again slowly moved the ball up the field but their drive stalled at the Oregon 42 and they punted the ball back to the Ducks. Auburn did a better job of pinning the Ducks, dropping the punt at the Oregon 14 with 6:34 left in the game. Once again the Ducks could not muster any offense and punted the ball back to Auburn with 5:05 left. It was Newton’s time to shine and earn that #1 draft status. Oregon had different plans however and on a 2nd down run by Newton the ball was stripped from him by linebacker Casey Matthews and recovered by the Ducks at the Auburn 40 yard line. A dumb personal foul penalty sent them back 15 yard but they were still at their own 45 with 4:54 remaining, needing a touchdown and another two-point conversion to tie the game. Thomas started to lead Oregon down the field but was quickly face with a 4th and 5 at the Auburn 40. Darron Thomas came up with a big 29 yard pass to receiver D.J. Davis to give Oregon a 1st and 10 at the Auburn 11. Three plays later Thomas connected with James on a two yard touchdown pass, getting the Ducks within two points. Those two points came on the next play when Thomas connected with Maehl to tie the game at 19-19 with 2:33 left. There was 2:33 left and Auburn needed a field goal to win the game. After Newton had fumbled on the last possession it would mean that a lot of the ball handling would be done by freshman running back Michael Dyer. After opening with a 15 yard pass from Newton to Emory Blake the Tigers called Dyer’s number on 1st down with an off tackle play. Dyer was dragged down after gaining 6 or 7 yards. Dyer hopped up and he and everyone else on the field thought that the play was over but the whistle hadn’t blown. The coaches were yelling from the sidelines to Dyer to keep running. So Dyer started running, he ran the ball all the way down to the Oregon 23 yard line. Much to the shock of everyone in the stands as well as everyone watching at home and the players for both teams the play stood. The ref had never blown the whistle and Dyer’s knee had never hit the ground. The Tigers were close to field goal range, if not already there yet. Dyer decided to make an encore on 3rd down by running it 16 yards down to the Oregon 1 and stopping before scoring a touchdown so they could kick the ball as time expired and not give Oregon a chance to make a miracle play on a kick return or a throwback pass. Auburn kicker Wes Bynum kicked the game winning field goal as time expired and Auburn won their first National Championship in 53 years. Bench coach Tim Bogar: Let’s start with the old guy at the new position. Bogar had been the Red Sox third base coach for the past two seasons after spending his prior two seasons as the Sox first base coach. Bogar did not exactly endear himself to Red Sox Nation late last season after he was responsible for several guys running into outs on the base paths. Now I know that a huge part of the job is to send runners home but running into a few outs doesn’t make a guy a bad person, or even a bad coach. Dale Sveum has been successful in Milwaukee as hitting coach and bench coach since Red Sox Nation was ready to burn him at the stake for running into a few outs near the end of the 2005 season. Now he is the manager of the Cubs and was nearly manager of the Red Sox. Bogar is known as a bright baseball mind and he will be able to use his smarts more effectively as the bench coach of the Sox. He is familiar with Bobby Valentine, having played a half of a season for him in New York, and Valentine should be a good mentor for Bogar, who seems to be a candidate for a future manager’s position. He will be less scrutinized in his new position which should make him feel more comfortable. This was a good move for the Red Sox to make for both parties. If he is the eventual successor to Valentine people won’t remember guys running into outs if the Sox have success during his tenure as bench coach. First Base Coach Alex Ochoa: Ochoa has actually been bouncing around as a coach and instructor in the Sox minor league system for the past three seasons. The Cuban born former utility infielder played 8 seasons in the majors followed by 5 over in Japan. The value that Ochoa brings to the coaching staff is his Latin background. Ben Cherington is looking to get back into the Latin baseball market and having a native Spanish speaker on the staff is always helpful. Might Ochoa be a sign that the Sox are prepared to make an effort to bring in Cuban defector Yoennis Cespedes? Maybe, maybe not but Ochoa was known as a high energy, good clubhouse guy when he was a player and is exactly the type of guy that the Red Sox needed to add to the clubhouse this off season. His responsibilities are not as important as the rest of the guys and he is in a position that is barely scrutinized. He should be a pretty good addition to the staff. 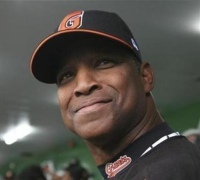 Third Base Coach Jerry Royster: Royster played 16 seasons at third base for 6 different major league teams. His first job on a major league coaching staff was with the Colorado Rockies as 3rd base coach. He joined the Milwaukee Brewers staff in 2002 and was named interim manager of the team after manager Davey Lopes was fired 15 games into the season. He compiled a 53-94 finish that year and was not retained by the Brewers. He spent some time managing and coaching in the minor leagues for the Dodgers and Padres organizations after he left Milwaukee. He went on to manage the Lotte Giants of the Korean League from 2008-2010 and returned to the U.S. after they did not renew his three year contract. This is his first job on a major league staff since he was the interim manager for the Brewers in ’02. It will be the first time that he serves as a 3rd base coach since he held the job for the expansion Rockies in 1993. He has done a lot since then though, include managing a major league team for a year and spending a lot of time managing in the minors. Of course, like Bogar and Sveum before him, people will judge him on how many guys will run into outs on his watch. It’s hard to quantify how good of a 3rd base coach he’ll be since he hasn’t done the job in nearly 20 years, so we will have to hold off judgment on Royster until we actually see him do the job but he does bring loads of experience. Pitching Coach Bob McClure: This was the most important position to be filled during the off season. It was an interesting hire since the Red Sox had hired him just to be a roving pitching instructor for the organization a little earlier in the off season and they had interviewed some highly qualified candidates, former Marlins and Blue Jays pitching coach Brad Arnsberg and Tampa Bay’s AAA pitching coach Neil Allen among them. McClure pitched for 20 seasons in the majors, 10 with the Milwaukee Brewers. McClure spent six seasons as pitching coach in the Colorado Rockies organization after his playing career ended. He got his first major league coaching job in 2006 when he was hired by the Kansas City Royals to be their pitching coach. 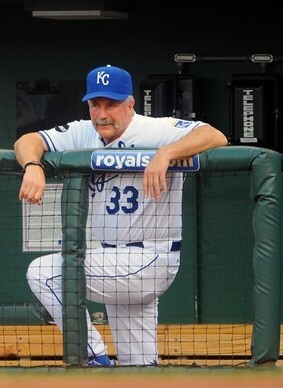 He held that job for the past six seasons until he was fired by the Royals after the 2011 season. It’s a hire that’s received mixed reviews. On one hand he was fired by the Royals but on the other he did spend 6 seasons on the staff, which is good when you’re on a rebuilding staff I suppose but you can’t help but shake the feeling that Allen would have been a better hire. Again it looked as if the Sox brass were afraid to make the move to a younger guy in fear he would not have the respect in the clubhouse so they opted for the experienced guy. McClure will have his hands full trying to maneuver a staff that needs improvement as well as a group of aces who are under the microscope. I am skeptical of this hire but I also thought Curt Young was a good hire, and he wasn’t, so we’ll see what happens. 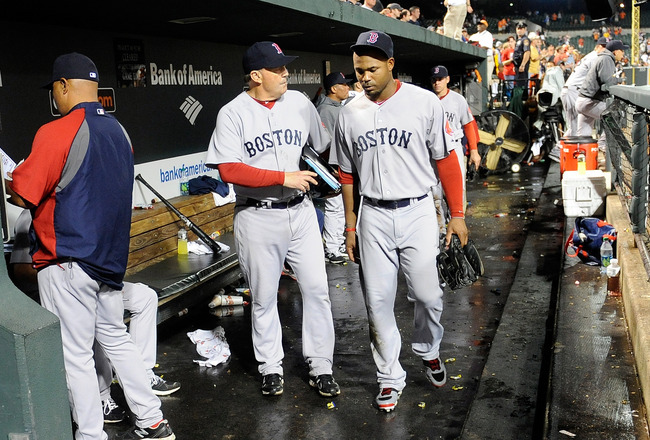 Strength and Conditioning Coach Mike Boyle: This may well be the best hire of the off season by the Red Sox. 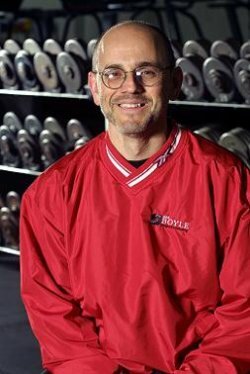 Boyle is renowned for being an expert on strength and conditioning and has been the head strength and conditioning coach for Boston University for the past 15 years. He also served as the strength and conditioning coach for the Boston Bruins from 1991-1999 and also served the 1998 United States women’s hockey team at the Olympics in the same capacity. A hockey strength coach working with baseball players? I wouldn’t want to be those guys. Boyle has run a successful strength and conditioning club in the Boston area since 1996. (Link to his company’s web site) It was voted the #1 health club in America by Men’s Health. The Sox obviously had conditioning issues last year and the brass spared no expense and did not fool around when it came to filling the role of Strength and Conditioning coach. 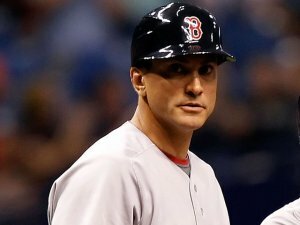 Boyle might be the best hire by the Sox in a long time. In addition to the new coaches Hitting Coach Dave Magadan and Bullpen Coach Gary Tuck return in their roles. Magadan has been the Sox hitting coach for the past five seasons and obviously offense has not been a problem. The Sox have perennially been one of the top offensive clubs in the league since Magadan has been with the club. Tuck has also been on the Sox coaching staff for five seasons. He is a very popular guy in the clubhouse, he’s got an eccentric personality that plays well with the players. He is also a catching instructor for the organization during spring training. For better or worse this is the staff that Bobby Valentine will have under him for his first season in Boston. McClure is the most important hire for the Sox and we will see how that pans out. I like Bogar’s move to bench coach as I think he is well suited for that job and can work away from the scrutiny that comes with being 3rd base coach. Boyle is a home run hire and Magadan and Tuck were good retains by Valentine. This coaching staff will really live and die by the success of Valentine and McClure. Hopefully things click early for these guys and we can put the sins of Red Sox past behind us quickly. There is not a much more dramatic thing in sports than bitter rivals going at it in postseason play. It’s even better when it goes into overtime. In the first round, seven game playoff series in last year’s Stanley Cup playoffs the Bruins and Canadiens went into overtime three times. The second of the two overtime games went into double overtime. What’s better than a double overtime playoff game between two historic rivals? It was Game 5 of the B’s and Habs first round series. This was the 164th game that the Bruins and Canadiens had played each other in the postseason since they had their first playoff match up back in 1929. The game was played at TD Garden in Boston. The Bruins had lost the first two games of the series in Boston and then returned the favor in Games 3 and 4 when they defeated the Canadiens in Montreal. Goalies Tim Thomas and Carey Price had both gone stretches where they were nearly impenetrable. The first and second periods were two of the best that you had ever seen for two goalies in the same playoff game. Thomas and Price matched each other shot for shot in the first two frames. Thomas had 16 saves through the first two periods and Price already had 21. Neither team’s offense could manage a goal against either guy. We went into the 3rd period with the score tied at 0-0. The Bruins started with a flurry of offense in the 3rd period but they were stonewalled by Price. Price saved the first 6 shots of the period by the B’s, all by the 4:00 mark. Finally at 4:33 someone found the net. Bruins winger Brad Marchand found the puck on a rebound and put it into the goal to end the scoring drought and give the B’s a 1-0 3rd period lead. Thomas was up to the challenge of preserving the victory for the Bruins. He stopped the first 7 shots on goal for the Canadiens in the period. He stopped shot #8 of as well at 13:39 in but Jeff Halpern took the rebound of that shot and put it into the net to tie the game at 1-1. The two teams played out the last 6 minutes of the game with neither team being able to hit the game-winning goal. This would be the second overtime game in a row. By the end of the 3rd period Thomas had added 12 saves to his total for the night, bringing the grand total to 28, and Price had added 9, giving him 30 for the game. Now whoever slipped up first would lose the game for his team. 20 minutes in the first overtime period came and went without either team putting the puck into the net. The Bruins battered Carey Price with shots on goal throughout the first overtime period but Price turned everything back. He made 12 saves in the 1st overtime frame. The Canadiens took 9 shots at Thomas, who stopped them all. The 1st overtime period ended the way it began and we were to be subjected to a 5th period of hockey action between these two historic franchises. We would go 9 more minutes in the 3rd period. 5 minutes into the period it had looked like Brian Gionta had the game won for Montreal. The Habs were on a 2-1 break and Gionta took the pass and one timed the puck into the vacated side of the net but somehow Thomas reached over and made a miraculous stop of the shot. Roughly four minutes later Andrew Ference blasted a shot at Carey Price that Price stopped with his pad. Nathan Horton was there to clean up the rebound and Price did not stop his shot. 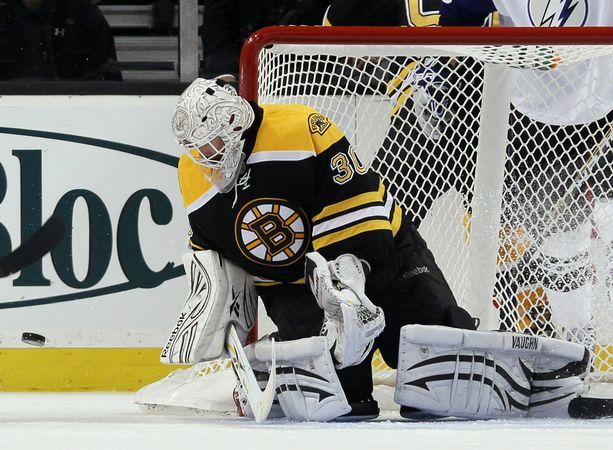 Horton put the puck into the net and gave the Bruins a grueling Game 5 victory after 89 minutes of hockey. This was one of the greatest goalie duels that you will ever see in the playoffs. Carey Price had 49 saves on 51 shots. 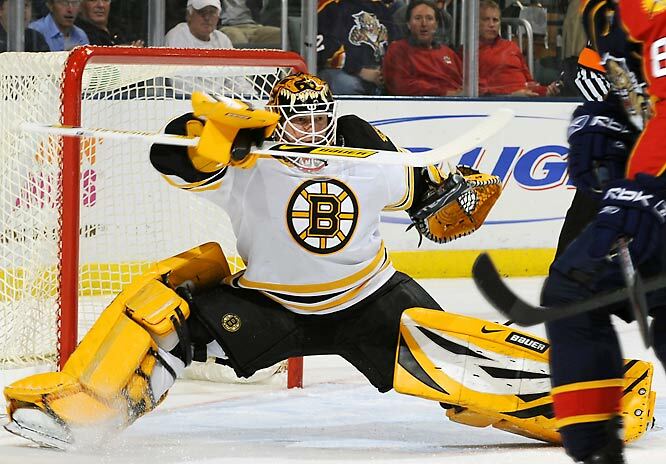 Tim Thomas saved all 44 of the shots that he faced. Both goalies played all 89 minutes of the game. In the end the Bruins took the game and a 3-2 series lead. The Canadiens would take game 6 in Montreal and they would come back to the Garden for Game 7, where the B’s won in overtime again to beat the Canadiens in the series. 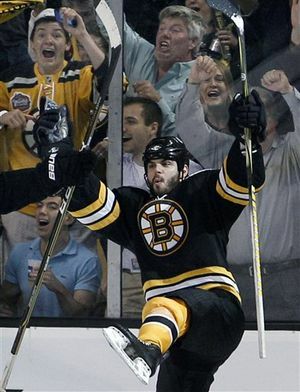 In the Bruins run to the cup this was the most exciting series. It was fitting that it was Montreal they had to play first and had to play it to the bone just to get past them. Whatever doesn’t kill you makes you stronger and when the Canadiens couldn’t put the Bruins down the B’s didn’t look back until they hoisted the Cup.